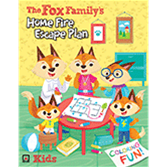 The Fox family draws children into a colorful world of fire safety! The Foxes are making a home fire escape plan and kids can follow along, absorbing critical fire safety lessons as they color. Mr. and Mrs. Fox, their two little ones, and Grandmother Fox reinforce the lifesaving message that every room needs two ways out in case of fire. This engaging six-page coloring book also features a fire escape plan checklist to summarize the lessons learned.